Sometimes we reply in delight, as with What Pet Should I Get? by Dr. Seuss. At other times, we are by turns confused, horrified, reverential, as with Harper Lee’s Go Set a Watchman, the recently unearthed first draft of her masterpiece, To Kill a Mockingbird. Yet another new-old book has come to us recently. It hasn’t gotten as much attention, but its particular call from the past is no less powerful, both for what it tells us of its place and time, and for what we know, nearly eighty years later, of how that place and time came to an end. 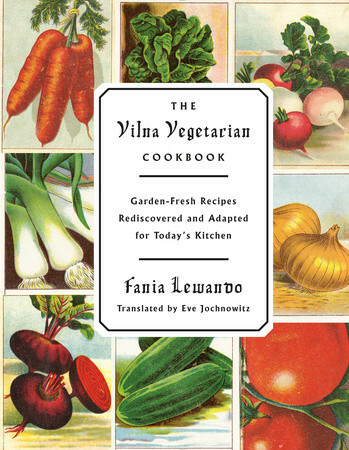 The book is The Vilna Vegetarian Cookbook: Garden-Fresh Recipes Rediscovered and Adapted for Today’s Kitchens by Fania Lewando, lovingly translated, annotated and adapted for contemporary kitchens by Eve Jochnowitz, and published by Schocken Books. 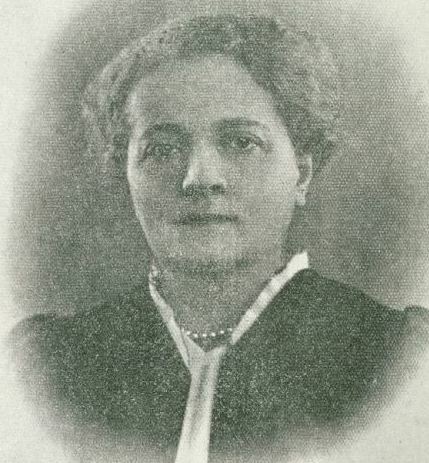 Fania Lewando and her husband Lazar were the owners of a vegetarian restaurant in Vilna, the Jewish name for the city of Vilnius, whose nationality teetered between Poland and Lithuania in the years after World War I. Vilna was home to a Jewish community large and lively enough that at one time the city was dubbed the Jerusalem of Lithuania. It was a cosmopolitan metropolis where the Haskalah, the secular Jewish “Enlightenment,” flowered, and a dynamic arts scene thrived. The famed YIVO, the Institute for Jewish Research, had its first headquarters there. The Lewandos’ cafe was a gathering place for the city’s Jewish intelligentsia, who appreciated her innovative vegetarian cuisine. Besides running her restaurant, Fania Lewando was a noted spokeswoman for the cause of vegetarianism and the then-young science of nutrition. She published her cookbook in 1938. The next year, the Soviets took control of Lithuania; they were followed in 1941 by the Nazis. According to an essay in the new edition of Lewando’s book by Efraim Sicher, her great nephew, the Lewandos were likely captured by the Soviets while fleeing the Nazis, and probably killed soon afterward. The Jewish community of Vilna was obliterated like so many others. But the YIVO had relocated to New York in 1940, before the Nazi occupation, and somewhere along the way, a copy of Lewando’s book wound up in its library. It sat there until a few years ago, when Barbara Mazur and Wendy Waxman discovered it. They showed a oopy to Joan Nathan, the Jewish food writer, who brought it to Schocken. Eve Jochnowitz, the Yiddishist and culinary ethnographer, had actually seen the book some years earlier at YIVO and had fallen under its spell. She was tapped for the project. The new volume is the result. In it, the past speaks to us in a surprisingly contemporary voice. A lifetime before Michael Pollan coined his famous, “Eat food. Mostly plants,” Lewando was writing the first lines of her book: “It has long been established by the highest medical authorities that food made from fruits and vegetable is far healthier and more suitable for the human organism than food made from meat.” Indeed, she cooks up fruits and vegetables of all sorts in seemingly endless ways. While many of recipes are rooted in the Old World Ashkenazi palate (latkes, kugel, blintzes), several would be at home on the restaurant menus of today (cauliflower cutlets, for example, leek frittata, coffee ices, and marinated pears that are a lot like the sweet-sour gastriques). But The Vilna Vegetarian is definitely of its time. The recipes are written in old-timey cookbook style; there are no ingredient lists; ingredients and measures are contained within the rather terse instructions, which assume that readers have basic kitchen skills. They also reflect the technology of the time; as Jochnowitz explains, no oven temperatures are listed because the coal and wood-fired ovens of the day couldn’t calibrate exact temperatures. There are no photographs of the food in this book; instead, colorful botanical illustrations from the 1938 edition decorate its pages. It also includes essays from that period on the value of fruits and vegetables and Jewish vegetarianism, and a chapter of notes from the restaurant’s guest book written by Vilna luminaries, some of whom, we are told, survived, and some who did not. The breadth of Jochnowitz’s work on this volume cannot be understated. In addition to translating from the Yiddish and parsing Lewando’s personal kitchen usage, she also converted the original metric measures to American cups and spoons, tested recipes, and added helpful notes for today’s cooks where necessary. Most of the recipes can be prepared and enjoyed by contemporary readers. (Who among us wouldn’t enjoy a stuffed turnover or a homemade vegetable soup?) But some recipes will only be read with wonderment by 21st-century cooks, like the one for pickled apples that calls for lining a barrel with cherry leaves and dill, filling it with apples, adding buckets of boiling water, sugar, salt, and molasses to cover, and weighting the lid with “freshly washed stones.” Oh, and replenishing those buckets of sugar syrup daily for eight weeks. I won’t be trying that one any time soon. But I am very glad to read about it. And glad, sad, and generally awestruck by the entire book, and by the voice of a woman who still calls to us so clearly: See, this is what it was like at my table. If you would like to see what Vilnius looks like today (with stretches of cityscape that look like the photos might have been taken in Fania Lewando’s time—and some fleeting scenes from the local Holocaust museum) here is a video tour from The New York Times website that I came across while preparing this profile. The last few decades have seen our attitude toward food change dramatically. We used to take it for granted. Sure, we stopped to eat it several times a day; we obsessed about its caloric content and its nutritional value; we celebrated and mourned with it; in times of shortage or famine, it became the focus of our lives. But it wasn’t so long ago that food as a subject for artistic or intellectual examination was unheard of. Traditionally, when we studied history, we charted the movements of kings and generals, heroes, and sometimes, heroines. When we wrote poetry or sang songs, love was (and still is) our theme. In recent years, TV has given us celebrity chefs; restaurant culture and easy air travel have introduced us to exotic cuisines; and universities have recognized a field called culinary history. Still, this consideration of food as a “serious” subject is rather new. Plenty of people continue to think about food only when they’re deciding whether to bring home pizza or Chinese. Imagine, then, the audacity of a 29-year-old author named M.F.K. Fisher, who in 1937 published a volume of essays on food. Serve It Forth combined history, memoir and meditation, a combination that would characterize Mary Frances Kennedy Fisher’s writing for the next half-century. Fisher “seized culinary writing” writes Joan Reardon in her lovely triple biography, M.F.K Fisher, Julia Child and Alice Waters: Celebrating the Pleasures of the Table (Crown, 1994), “from the domestic scientists, the packagers and promoters, even the ‘gourmets,’ and with cunning and daring, she placed it at the center of those ‘ageless celebrations’ of life.,’” Serve It Forth was the product of Fisher’s days as a young student bride, first in Dijon, France, where she tasted the glories of French cooking, and later, in Los Angeles, where a part-time afternoon job left her free to spend mornings reading culinary texts in the Los Angeles public library. This peripatetic education prepared her to chronicle the eating habits of ancient Greece and Rome, the role of the potato in everyday meals, her own experiences eating snails, Catherine de Medici’s culinary influence on France, dining alone, aphrodisiac foods and a poignant return to a much-loved restaurant. A strange mix, but one held together by Fisher’s unforgettable voice, now playful, now painterly, sometimes superior, and sometimes full of heartbreak for the crushed dreamers (including, at times, herself) that she observed in her travels. Whatever her mood, she never doubted the sensuality and the sacredness of eating. Word pictures like these pop out on every page, not only in Serve it Forth, but in the subsequent volumes: Consider the Oyster, published in 1941, which touches on everything from the oyster’s love life to the oyster loaf at Fisher’s mother’s boarding school; 1942’s How to Cook a Wolf, a wartime prescription for coping with ration cards and shortages; 1943’s The Gastronomical Me, an autobiography told in food memories; and 1949’s An Alphabet for Gourmets. 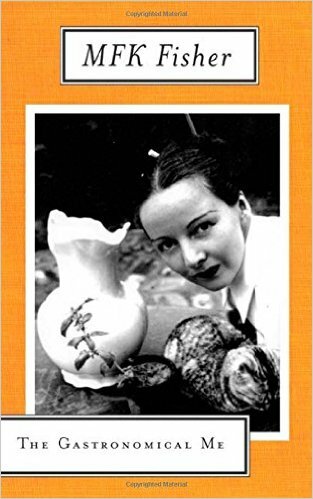 These five books, collected in 1954 in a celebrated volume called The Art of Eating, are probably her best known, but her output was far greater; before her death in 1992, Fisher produced 28 books, including a much-praised translation of French epicure Jean Anthelme Brillat-Savarin’s The Physiology of Taste. Nearly 75 years later, in an age whose very religion is fear of fat and carbs, and fear of food in general, those words take a new, more urgent dimension. Unlike so many of us, Fisher never took food for granted, and her message is as meaningful today as it was when she wrote it. Back in the ’90s, I went to hear food writer Ruth Reichl speak. I don’t remember what she said about the hot trends of those days, but I do recall very clearly her lament about Korean food. She had written about the cuisine of the tiny East Asian nation a few times, but even a platform as powerful as The New York Times, where she was the restaurant reviewer, could not push the cuisine onto the nation’s foodie radar. It was a puzzle, she said, because Korean food has several characteristics that you’d think would endear it to the American palate—succulent beef dishes and a signature hot sauce among them. That commentary has come back to me over the years, whenever an article about Korean food appeared—inevitably to little notice. Several years ago, when a Korean restaurant popped up in a small strip mall here in the ’burbs, I wondered if Korean food had finally arrived. But nope, the place closed a few months later. Now, in 2015, it seems as if Korean food is finally hot—or at least warm. I’ve been noticing a small but steady number articles and mentions on TV cooking shows, as well as notices of upcoming cookbooks. One such cookbook is already here. 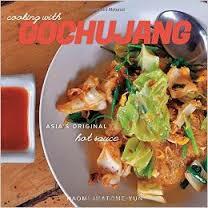 Cooking with Gochujang: Asia’s Original Hot Sauce (The Countryman Press) offers a nifty introduction to that aforementioned hot sauce. Gochujang is different from the fiery Mexican salsas we love, from the stinging acid-inferno of Indonesian sriracha or the tangy heat of your favorite Buffalo sauce. It’s “a chili paste,” says author Naomi Imatome-Yun, “with a complex spicy, sweet and deep flavor.” Made from fermented chilies, soybeans, sticky rice powder and salt, it has the consistency of paste. A yummy paste. This book of just 60 recipes includes instructions for making gochujang itself, but Iamtome-Yun notes that even in Korea, bottled is the rule. (Kind of like ketchup—only the most adventurous cooks would dare to make it.) Most of the recipes here use gochujang as an ingredient, and while traditional Korean dishes like bibimbap (rice with veggies) and kimchi bokumbap (fried rice with spicy fermented cabbage) are included, Iamtome-Yun incorporates gochujang into other ethnic cuisines—think LA-Style Chicken Quesadillas, Seoulful Cheese Dip, pasta sauce and even peanut butter cookies. This is how an ethnic cuisine makes its way into the American kitchen—one easy-to-use ingredient at a time. Recall how teriyaki sauce, with its perfect balance of salt, sweet and brewed yumminess became the marinade ingredient a few decades ago. Back then, home cooks who would no more consider rolling their own yellowtail sushi than—I dunno, milking their own cows —were suddenly using teriyaki with abandon. And once we mastered teriyaki, we learned a bit about Japanese cuisine, and those home sushi kits started appearing. 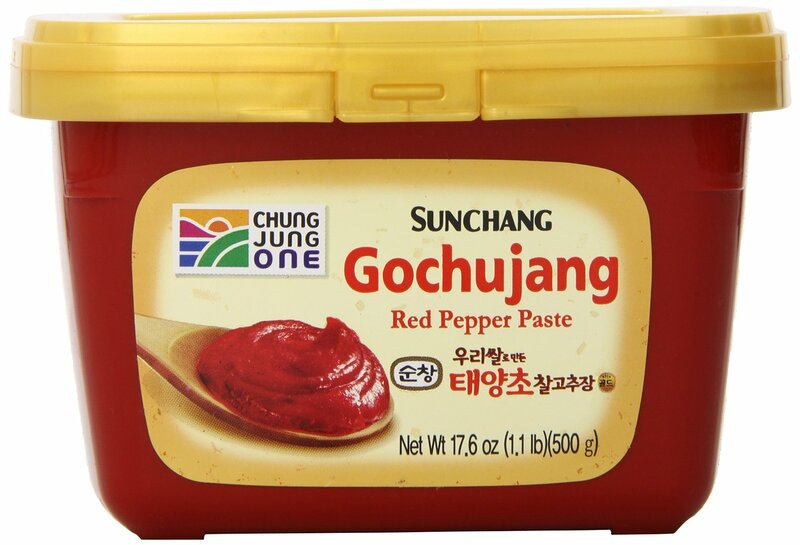 Will gochujang follow the same trajectory? Will Korean food finally be recognized by mainstream America? Hard to say. But if it does, books like this will help make it so. Long before “locavore” was a word, before the Food Network made cooking a spectator sport, before Chez Panisse and California cuisine, before even Julia Child and James Beard—a good century or two before what we now think of as the seminal moments on our culinary timeline—there was New Orleans. It’s true that rich and diverse food cultures could be found from sea to shining sea, but New Orleans food was the haute cuisine of America. Jambalaya, brimming with andouille sausage; shrimp gumbo, thick with okra or file; crawfish étouffée, creamy, savory and utterly delicious; less fancy but no less satisfying muffaletta and po’boy sandwiches; oysters so rich (and green) they were named for Rockefeller; sweet, delectable pralines; boozy, buttery, flaming bananas Foster—these are but a few of the reasons that New Orleans was long the culinary destination of the nation. Today, food has become our national obsession, and a visit to NOLA is just one of a multitude of boxes to be checked on a foodie bucket list. Really, though, New Orleans should still be near the top of that list. As Michael Murphy reports in Eat Dat: New Orleans: A Guide to the Unique Food Culture of the Crescent City (The Countryman Press), the Big Easy is still—even after the devastation wrought by Hurricane Katrina in 2005—one of the most vibrant food towns in the United States—or anywhere, for that matter. Murphy, a former publisher of William Morrow who moved to New Orleans in 2009, has written a guidebook to more than 250 of the city’s eateries. Yet, while it’s organized like a traditional guidebook, with chapters on the city’s neighborhoods and their notable restaurants, it reads like a cross between a work of culinary anthropology and the foodie-gossip column of your dreams. Murphy recounts the history of various New Orleans culinary institutions and tells about the people behind them, both past and present. He sides with New Orleans culinary historian Lolis Eric Elie, who recalibrates the French contribution to the city’s Creole foodways and says that its African citizens should get as much if not more credit for its most famous dishes. Murphy chronicles the long-lived feud that fractured the Brennan family, renowned for such restaurants as Brennan’s and Commander’s Palace. 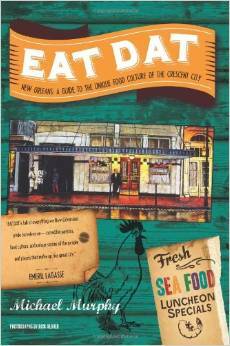 Noted chefs Emeril Lagasse, Paul Prudhomme, the late Jamie Shannon, and Susan Spicer appear on the book’s pages, as do local legends Leah Chase and Willie Mae Seaton. You’ll wish he could sit in one of those seats next to you. With his deep knowledge of New Orleans and irreverent wit, Murphy makes a delightful travel companion. You will read this book with pleasure, whether you are actually traveling to New Orleans or just dreaming of that perfect beignet, curled up in your armchair at home. The phrase “reading for pleasure” takes on a different meaning for every reader. Some choose mysteries; others go for romance or biography or a particular author. For the past few years, one of my favorite escapist reading choices hasn’t been an author or a genre, but a subject: Julia Child. Her life and work make for reading that I, for one, find irresistible: cooking and eating, Paris, true love, international intrigue and the triumph of perseverance. Plus, there’s Julia herself, the force of nature, the exuberant soul whose wit and charm belied a work ethic of steel. Julia, who told legions of fans that of course they could cook haute French cuisine, and who counseled them to take courage in the kitchen. Julia, who, more than any single individual, transformed the way we think about food. 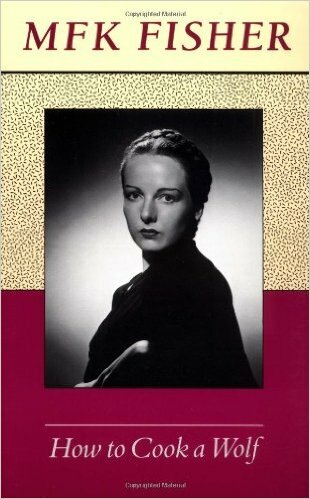 Even now, eight years after her death at age 91, Juliaphiles like me want more. And lucky for us, the past few years have seen the publication of a shelf full of books about Julia. 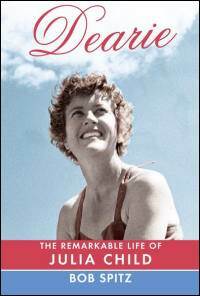 Since the 1999 publication of Noel Riley Fitch’s 592-page doorstop of a biography, Appetite for Life, there have been at least nine volumes devoted to Julia’s life and times, including her own posthumously published memoir, My Life in France. And while they all cover the same waterfront, they’re all different enough to make engrossing and pleasurable reading. The two talked about a biography, but Spitz had other projects and did not start on Dearie until after Julia’s death. I must admit that it took me a while to love this book. In the early chapters, Spitz sometimes takes a portentous tone, endowing simple events with great meaning. Example: in kindergarten, Julia McWilliams learned to follow rules and listen to instructions, which Spitz notes are “prerequisites for following a recipe.” One wonders at the other five-year-old rule-followers who did not go on to culinary careers. But that’s just a quibble, and for the most part, it’s fun to follow Julia’s life from her youth in conservative Pasadena, California; through her wartime service in Asia (where she met her future husband, Paul Child); to their years in Paris and elsewhere in Europe (where she learned to cook and began her groundbreaking book, Mastering the Art of French Cooking); to her days of cookbook and TV stardom and beyond. Along the way, he offers snapshots of nearly a century of history—turn-of-the-century California; World War II in Washington, D.C. and the Pacific theater; postwar Europe; the early days of public television; and the evolution of the food scene in America. 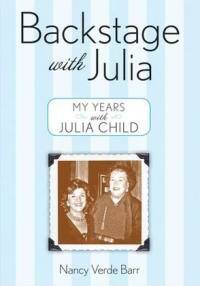 Julia told her own story in a memoir that came out not long after her death. My Life in France (Knopf, 2006) was written with Paul’s grandnephew Alex Prud’homme, and it is a beauty. 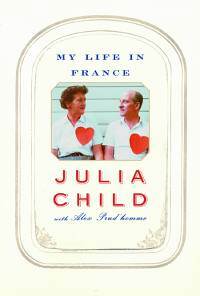 The pair worked on the book during the last two years of Julia’s life, with Prud’homme interviewing her, writing up what she had said and giving it to her for editing. Julia recalls her days not only in Paris (where Paul was stationed with the State Department), but in Marseille, (his next assignment) and in Provence, where they had a vacation home. Forty or fifty years after the fact, she recalls individual meals and how she cooked them, as well as the people she shared them with. It’s both sweet and frank, a graceful memoir of food, work and her years with the man she adored in a land they both loved. 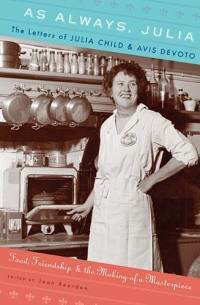 A happier story is told in As Always, Julia: The Letters of Julia Child and Avis DeVoto: Food, Friendship and the Making of a Masterpiece (Houghton Mifflin, 2010). Joan Reardon, a food historian who has written on M.F.K. Fisher, was the editor of this volume, and she has done a wonderful job of selecting and judiciously annotating the correspondence of these two friends. They met by mail in 1952, when Julia sent a fan letter to Avis DeVoto’s husband, the historian and writer Bernard DeVoto. He had written a column bemoaning the poor quality of kitchen knives and Julia sent him a good one from Paris. Avis DeVoto, who handled her husband’s correspondence, wrote back, launching a friendship-by-mail that lasted for years and resulted in the publication of Mastering; it was Avis DeVoto who made the introductions that eventually got the book published. Reading this book is pure pleasure; sixty years later, the two women’s voices dance off the page as they exchange notes on cooking and recipes, husbands, politics, and the progress of the book, which took years to complete. You’ll enjoy meeting the dynamic DeVoto, and if you want to know what Julia was like in private, in her own voice, this is the book to read. 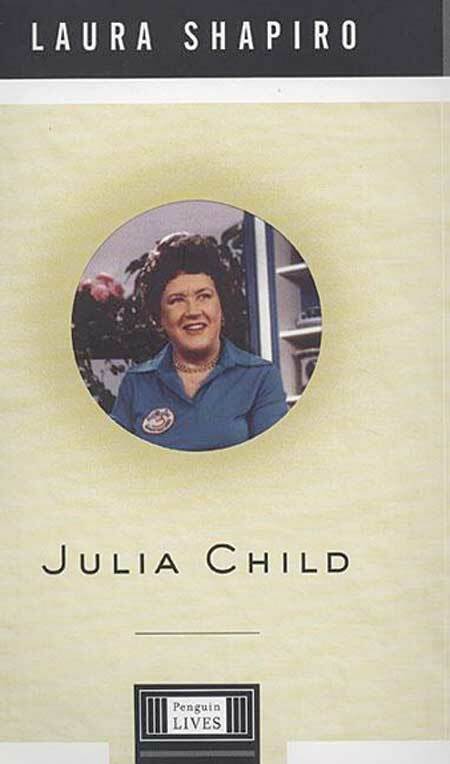 Another angle on the Julia story can be found in Backstage with Julia: My Years with Julia Child by Nancy Verde Barr (John Wiley & Sons, Inc. 2007). 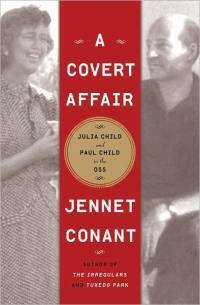 The book chronicles a later period in Julia’s life, some twenty years after the publication of Mastering, when Julia had been a TV star for nearly two decades. They met in 1980, when Barr was running cooking schools and raising her family. A friend asked her to help with a Planned Parenthood benefit where Julia would be doing a cooking demo; the two women clicked and Barr joined Julia’s team of assistant cooks, working with her on Good Morning America, traveling with her, and forging a friendship that lasted until Julia’s death. Barr is an engaging writer (and a wonderful cookbook author in her own right) and this slender book adds another perspective to the Julia canon. 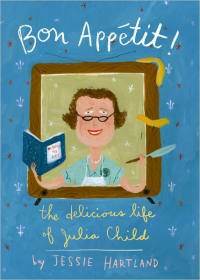 There are even two children’s books about Julia Child, both beautifully illustrated and full of charm. Bon Appetit! The Delicious Life of Julia Child, written and illustrated by Jessie Hartland (Schwartz & Wade, 2012) offers up Julia’s life in storyboard form, with multiple hand-lettered pictures spilling from each page. Beguiling scenes of Paris and of Julia in her kitchen with Paul accompany the familiar story, which ends with Julia’s first TV show. 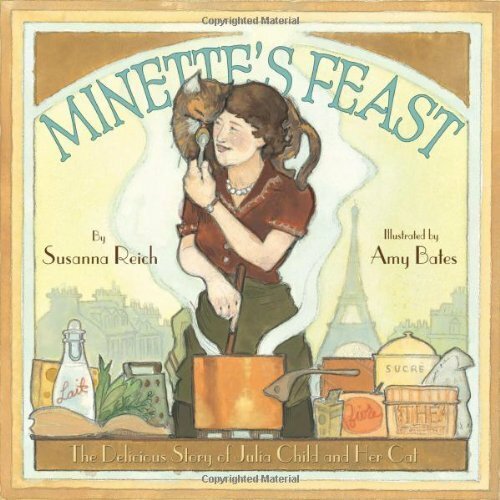 Minette’s Feast: The Delicious Story of Julia Child and her Cat, written by Susanna Reich and illustrated by Amy Bates (Abrams Books for Young Readers, 2012) tells Julia’s story from the point of view of her cat, Minette. Reich’s cat’s-eye-view narrative and Bates’ haunting pictures of Paris nicely capture Julia’s years there. Young readers will surely enjoy these two books (my daughter and niece did), but I can’t help thinking that their elders—who remember Julia in her heyday—will enjoy them even more. There’s actually another whole book devoted to Julia’s feline obsession. 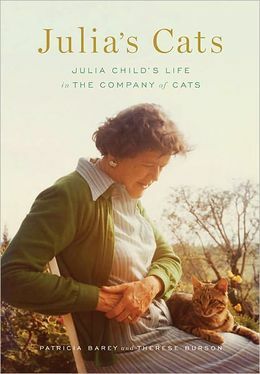 Julia’s Cats: Julia Child’s Life in the Company of Cats by Patricia Barry and Therese Burson was published by Abrams in 2012. This is, contrary to what you might expect, a serious biography, and it tells Julia’s story with an emphasis on the cats that joined her household over the years. (Minette was the first of many.) If you are both cat lover and a Juliaphile (like me) this book is, um, sheer catnip. Which I suppose is why, years after her passing, we’re still reading about Julia—and enjoying every page. Is Chinese baby formula dairy or soy based? The question occurred to me so suddenly and with such force that I had to check myself to make sure that I hadn’t blurted it aloud. But no. The other parents-to-be sitting in the meeting room in the offices of Spence-Chapin, the venerable New York City adoption agency, were listening undisturbed to our social worker, who was explaining yet another item in the mountain of paperwork we had to complete before we would be put on a waiting list that would eventually result in a trip to China to meet our longed-for daughters. I tried to listen, too, and to take notes, but I couldn’t help picturing an innocent babe, placed into my arms fresh from the orphanage, the only home she’d ever known. Would she like the formula that I’d bring from America for her? Would she recoil at its unfamiliar scent? Oh, God, what if she hated it? What if, in our first hours and days together, when she’d be assaulted by newness at every turn, I couldn’t offer her the comfort of a familiar mouthful of food? I pictured my baby wailing and hungry and wondered what on earth I would do if that picture became a reality. Resuming my note-taking, I tried to focus on the form under discussion. But the questions stayed with me, and at the end of the session I approached the social worker. So much for that mom-to-be anxiety attack. But it got me to thinking: If an infant has been taking a particular kind of nourishment for her whole, albeit short, life, what happens when you change that form of nourishment suddenly? To put it in another way, do babies have comfort food? So much has been made of that term in recent years. Meat loaf and mashed potatoes and macaroni and cheese have been rhapsodized and eulogized so often, you’d think they were ambrosia. Of course, what’s comfort to one palate is exotic—or appalling—to another. My Argentinean friend speaks lovingly of the blood sausage and tripe, but he gags at the mere mention of root beer, my childhood favorite. For some souls out there on this small planet, comfort food is the roasted, carefully browned rat that I saw for sale at a street market outside Bangkok. (A case of chacun a son goût if ever there was one.) But while the foodstuff might vary, the idea is the same no matter where you go—comfort food is the food of home. It’s what we ate in our earliest experience of the restorative powers of the table, before, well, whatever came afterward. I thought about this as I drove home from the agency with my folders of paperwork: Do babies develop food preferences? Can they form taste memories even as their first teeth are coming in? In short, can they have comfort food? A few months later in China, my child answered my question—and it had nothing to do with baby formula. It happened on the third night after I got Jessica. We were settled into our hotel in the capital city of the province where she was born, waiting for all the official paperwork necessary to finalize her adoption. On that evening, my sister (who had accompanied me to China) and I went down to a late supper in the hotel dining room, with baby Jessica in her stroller. We were dining late because my newly acquired eight-month-old had had a late nap. When she woke up, I had fumbled my way through a diaper change and her dinner—a bottle of formula mixed with rice cereal, some puréed peas and mashed bananas—which, despite my lack of finesse, she seemed to enjoy. The peas necessitated a thorough sponge bath, and when that was done, we dressed her again and set off for our own meal. It was after nine. By that time, we didn’t feel like anything complicated, so we just ordered big bowls of noodle soup. The dining room was tranquil and nearly empty, and the three of us sat companionably waiting for the food, Jessica content with a full tummy, or so I thought. But when the waitress came to our table with two steaming bowls, my tiny baby let out a series of large, loud screams. Our few fellow diners turned to stare. In the three days I had known this child, such a thing had never happened. Was she suddenly sick? In pain? Just cranky? After a few moments of new-mommy terror, I realized the obvious. She wanted the soup. A one-page “bio” of my baby that had come from her orphanage had mentioned that her diet included soup, but the information had been sketchy, and I was a strict and nervous follower of my baby books. These advised introducing single foods, not blends; the better to identify the cause in case Baby had an allergic reaction. So Jessica had been drinking formula mixed with rice cereal and eating simple baby-food purées and mashed bananas. My heart was overflowing. This tiny being, so trusting and innocent in the face of everything new—new mommy, new auntie; a new crib after so many months spent in the orphanage issue; the new surroundings of the hotel, with its shiny brass fixtures and mirrored halls; rides in elevators with doors that opened and closed; rides on buses with their smells of diesel fuel; a new stroller with belts and buckles; forays in that stroller over bumpy sidewalks to vast green parks and bustling department stores; new clothes and new diapers; new toys—almost everything she had encountered over the past three days was cosmically different from what she had experienced for the first months of her life. Yet, she had greeted each new phenomenon with smiles and coos. And now she smelled soup and saw the big bowls, and she knew what it was, and she wanted it. I blew on it to cool it and spooned a bit into her mouth. Instantly, she was calm. We shared the rest of the bowl. How powerful, I thought, was the appeal of something delicious, even for so tiny a person. When we came home to Connecticut, I made a big pot of my mother’s chicken noodle soup—my own comfort food, but not so very different from the noodle soup we’d shared in China. My daughter dove in, eating the noodles with her fingers. And now I know: Babies surely do have comfort food. For mine, it was soup. And not age or language or nationality—nothing—could stop her from trying to taste it. Copyright Karen Berman 2012. Permission is required to reproduce part or all of this essay. I was making my lists for our family holiday gathering a few days ago, and as I went over the menu—old-fashioned brisket and potato latkes—it occurred to me (a writer of cookbooks) that the two women whose cooking most influenced my Chanukah repertoire probably never consulted a cookbook in their lives. In my grandmothers’ day, cooking from cookbooks, or even written recipes, was hardly a universal practice. Girls learned to cook by helping in the kitchen and by the time they had kitchens of their own, they had mastered the art. Of course, there were books to consult if a cook was so inclined; recipe collections had been around for at least a millennium and a half. But cookbooks didn’t figure in my grandmothers’ world. How could they? There was no money, at least not in their early years, and anyway, neither one could read much English; one could barely read at all. My grandmothers kept their recipes in their heads. Their hands and eyes were their only measuring tools. Fannie, my mother’s mother, and Sarah, my father’s mother, had both sailed from Eastern Europe in the first years of the 20th century. They did not know each other until my parents met and married, but their young lives followed oddly similar trajectories. Both were barely into their teens when they crossed the Atlantic in steerage class, two among millions of immigrants who landed at Ellis Island hoping to better their lives. Years later, Fannie recalled being seasick for most of her journey. Sarah remembered how she and her younger sister, traveling alone, were detained at Ellis Island, waiting, terrified, for an older brother who was already settled in America to come and get them. Fannie could read Yiddish; she had had some schooling in her hometown of Lemburg, then part of the Austro-Hungarian Empire. Sarah, born in a shtetl in Poland, lost her mother when she was three, and never had any schooling. Both were sent to live with their older sisters in America, Fannie to Brooklyn, and Sarah to Scranton, Pennsylvania. Both elder sisters quickly pronounced them too old for school and conscripted them to help with the housework. But both of my grandmothers rebelled. Fannie enrolled in night school and learned to read a bit of English; she found work as a seamstress in a Lower East Side factory. Sarah, deeply offended by her sister’s refusal to let her go to school, jumped at a neighbor’s offer of domestic work and became a wage earner.In time, both married and had children, but the American streets that they traveled were hardly paved with gold. At the height of the Depression, Fannie’s husband died, leaving her with six children, the youngest of whom—my mother—was just six months old. With no pension in those pre-Social Security days, she survived on public assistance, plus the after-school wages of the elder children and her own genius for household management. Around the same time, Sarah’s husband suffered a heart attack. Medical wisdom at the time held that heart patients needed rest. So my grandfather retired from the silk mills of Paterson, New Jersey, where they lived by then, and Sarah became the breadwinner. Rising at dawn each day, she left her cold-water flat spotlessly clean and readied her two children for school before going off to her factory job. As years passed, my grandmothers’ lives became easier. By the time I was on the scene, both took pleasure in setting bountiful tables for family. They were both gifted cooks and more important, loving grandmothers. That was what I knew of them. That, and the magical holiday gatherings, full of aunts, uncles and cousins all having a lively, noisy time—and eating latkes. I look up from my Chanukah list-making, at my kitchen bookshelves overflowing with cookbooks. In the next room, more shelves are stocked with all sorts of books. How much of my life has been spent reading and writing—cookbooks and other books, for work and for pleasure. How much I owe to the two ladies whose courage and strength laid the foundation for the many extraordinary opportunities I’ve had. I close my eyes and I see Fannie reading her Yiddish newspaper intently, chuckling at the advice column one minute and the next poring over the lists of Holocaust survivors, always hoping to find the name of a missing loved one. I see Sarah, determined in her eighties to make up for her lack of schooling, working with a young volunteer, struggling to learn how to write her name. Now, a lifetime later, their lives seem to me to be nothing less than heroic. I never got Sarah’s recipe for latkes. I know that she added baking powder to the basic potato batter; the leavening made her latkes rise just a bit, and rendered them dense, chewy and delicious. Fannie’s latkes were different: light, crisp and luscious. I have her recipe; my mother transcribed it and made it her own. Now it’s my recipe, and my sister’s. And it occurs to me, as I continue making my lists, that as many cookbooks as I may own or acquire, I’ll never need one for potato latkes. Heat the oil in a large frying pan over medium heat. Spoon the batter in heaping tablespoons into the pan and fry. (Don’t crowd the pan too much; work in batches as necessary.) When the edges start to brown, turn with a spatula and fry on the other side. When the latkes are golden brown, remove from the oil with the spatula and place on paper towels to drain the excess oil. Repeat with remaining batter. Serve hot with sour cream and applesauce. 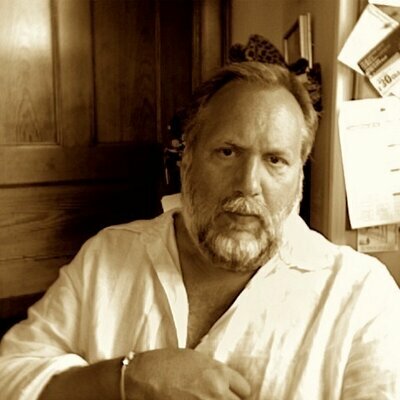 This post originally appeared on BookTrib.com.